Finally we get some concrete details on Greenfire's plan for a public/private partnership to revitalize downtown Durham. Parking Deck at Chapel Hill/Magnum - I'm pretty sure this is the parking deck that was recently identified as having structural issues. A new (larger?) parking deck will built, and wrapped with retail and with residential units on top. Woolworth's lot, Corcoran between Main & Parrish - This lot across from the SunTrust tower (which will be converted to a boutique hotel) will be the home of a 18-20 story office tower. Click here for a google map of these properties. The developers are asking for a $12 million incentives package from the city. The article doesn't go into much detail as to what sort of incentives we're talking about, although Endangered Durham mentions that a Synthetic TIF is envisioned for at least part of it. What's the other part? 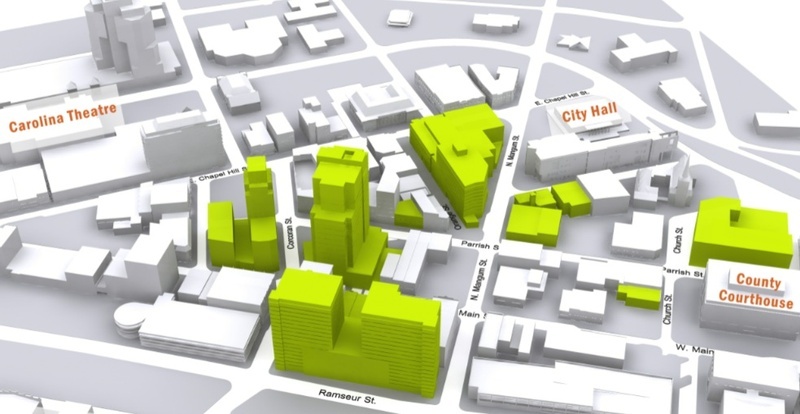 Could the city simply give the land to the developer as a part of the incentives? I wonder what the value of these properties is; must be pretty significant. This is great news for Durham, hopefully it moves forward in spite of the recent economic downturn. Greenfire seems to have some really great plans. I haven't heard yet about what they plan to do with the recently-acquired South Bank building though. I'm also a little concerned that a couple of the new proposed buildings might tower over the Hill (CCB/SunTrust) building. I've always thought that structure should be the "Empire State Building" of Durham's skyline. After all, they were designed by the same architects. Great plans. I see no downside to this. Durham needs somebody to come in and completely shake things up. I particularly love the Chapel Hill St./Mangum parking deck wrapped w/ retail. That area near Rue Cler and Dos Perros has real potential. This definitely deserves it's own thread (done). Thanks to BCR for his detailed coverage of this announcement. Here's the link for discussion of the Hill Bldg conversion to a boutique hotel. The Corcoran/Ramseur lot is the most important "link" to connect the American Tobacco/DBAP/Performin Arts hall area (vying with the west side for most activity as of right now) with inside the loop. The current pedestrian unfriendly zone comprised of Pettigrew, the tracks, the Ramseur part of the loop, and the sea of surface parking and decks will finally be "broken through". Yet other than Blackwell/Corcoran and Mangum, the next way to get across the tracks is West Chapel Hill street to the west and Roxboro to the east. - AT/DBAP/Arts section -- none now, some with this project. Maybe this sparks more construction along Ramseur. - West Side - West Village, Brightleaf, etc. - later phases of West Village are helping build a connection, but it still seems like a tight squeeze even with the L&M's overstreet enclosed bridge torn down. - Central Park/DAP area -- Foster and Rigsbee are showing signs of life, plenty of surface parking to redevlop. - east side -- connections via East Main, Liberty and Holloway have a lot of potential via surface parking. All four districts (east side seems to be igored by downtown durham, nowhere near the same level of activity as ITL and the other three areas) could come into their own, and there might not need to be one "united" downtown Durham. Greenfire's plan is just the first step to improving Durham. If it is the only plan, it will be difficult to succeed, though there are enough pieces to work if nothing else happens. If the plan comes to full fruition, it won't be the only thing happeing and several other pieces to the puzzle will start to fall in place. Hopefully the city goes along with this, as I really think it will change a lot of peoples perceptions on downtown Durham. Everyone I talk to (and even myself frankly) think that downtown Durham is kind of sketchy. WRAL has a story on the project. One of the Greenfire guys, Mike Lemanski, went to NCSU back in the day...not to mention, I believe a Durham native. I was a freshman when he was a senior, so I didn't know him really, but some of my friends who knew him better always talked highly of him. Motivated, smart, etc. He was big in the environmental club on campus so that probably explains the big push for these buildings to have so many enviro elements to them. And to think even though the company's been around barely 5 years, they could really could do wonders for downtown Durham. One interesting aspect of this, is the fact that Greenfire--in addition to acquiring lots of buildings and parcels in downtown--is making it's pitch for city-owned property outside of the realm of a publicly advertised RPF process, a la sites 1 & 4 in Raleigh. The whole plan has been kept secret until now and I'm guessing there are some who would say it's unfair for the city to 'conspire' with Greenfire on these publically-owned parcels. It's almost like the city staff has picked them as the master developer for downtown proper (inside the loop). That is the dissenting argument. I think a stronger argument is you have a motivated local developer who is moving forward towards revitalization where few--if any others--have gone before in the last 30 years. The city council will get questions about fairness, I'm sure, but with downtown's revitalization so close, I'd hate to see it slip away on a technicality. I would guess Mayor Bell will push this toward approval. good for durham. i hope this plan gets the go-ahead nod. While I agree that there is something to be said for the RFP process and fairness, we also need to consider time and situation. Durham, despite the recent developments of ATHD and WVillage, remains largely dead (this in a part of one of America's fastest growing regions). Durham's just asking to become a really cool city, but buy in from developers is a little slow. I fear that without a large-scale movement like this, it's going to take forever to get that town kick-started. I'm liking the direction of city with regard to the restaurants emerging and the DPAC, but I think they need something of the magnitude of American Tobacco right in the heart of downtown. At this point in time, I think Greenfire is showing the capability and will to make something great happen downtown. It's a risk, but one worth taking IMO. Since this plan would be implemented over the course of years, I see it being something worth approving. At NC State, Mike Lemanski was a writer when I was there. He did have a mostly single-track focus on environmental stories, but was a good writer. I know he was an enginering major, and I still don't know how he got into real estate, but more power to him. I met Carl Webb at a real estate devlopment seminar class at UNC a year or so ago and he seemed to be interested making the numbers but also producing a product the community wants and will buy into. I think city-owned land should go through the normal request for proposals process, but the way their plans for the city-owned land fits into their bigger vision/puzzle would be bigger/better than other proposals that would only develop the city's parcels. The council asked Greenfire some tough questions at a work session yesterday. Specifically, they are getting to what some of you have said here: do they have the financial backing to see this through amidst a potentially difficult economy? looks like a really nice project. Just when you think all is quiet. I especially like the tower part. The skylines are definitely changing around the triangle. Durham held a public forum on the Greenfire project, and the consensus seemed to be that many want the process to be deliberate, so the city can weight its options. Greenfire countered that they are ready and willing to get moving ASAP. I suppose they are calculating that the market will be there for the project once each phase is built out, and I'm sure they will taylor the phasing to the most immediately viable building project. The city council is putting the brakes on Greenfire's plans before they push forward on negotiations. There are some complaints over lost parking, but most over whether the city should proceed without getting assurances of whether Greenfire has the financial backing to finish the job. Well darn. I hope that's only a minor speedbump and nothing more serious. It is a testament to Durham's low expectations that absent from the discourse is the fact that no one involved with Greenfire has any significant real estate development experience. I am sure they have some well intentioned, articulate people. But to stage such a complicated project calls for seasoned talent. This group has revamped two small buildings and have yet to lease a single sf of retail. If this was a real city, the FRP process would be arduous to even let someone do a project of this scale on their own dime, even if they were not asking for a subsidy. ^The problem is that no one is rushing to construct anything in Durham-I sure as hell wouldn't. I would develop as much as possible in Durham if I had the funding!! Buy low, sell high. With American Tobacco and West Village/Brightleaf, Durham is quickly turning around. Hopefully an experienced partner/backer will emerge because I really like the look, feel and fine-grain of the Greenfire plan. The durham council received some assurances that Greenfire has the ability to pull this off. Particularly noteworthy is the inclusion that the Integral Group out of Atlanta is on the development team. One the one hand, Evil Developer makes a good point. This is risky, and one would think a competetive RFP process would be better approach and yield a positive outcome for the city. On the other hand, there doesn't seem to be a tremendous amount of interest in doing something on the scale that Greenfire is proposing, especially early in a recession, and in an area that hasn't seen much investment in a few decades. I think the saying "a bird in hand is worth two in the bush" fits well here. Dewayne Washington said it best when saying that the city is just as dark as it was 20 years ago. At the pace Durham moves maybe we will see a new building downtown in the next 20 years. I do think the DT area would be great place to film a horror/sci-fi movie kind of like Omega Man or the new Will Smith movie where the only signs of life are the humanoids living in the white windowless tower. I completely agree with the need for a backer, in the industry, we call that a "sponsor" i.e. the party that takes the entrepreneurial risk, but who supposedly knows what he are doing, and thus reaps the lion's share of the rewards. But, chicken and egg--it is easier to bring a sponsor if the city is already on the hook. "Burned before" is also a great observation. There are no quick fixes in urban revitalization. As we speak, Motricity has left American Tobacco, and West Village II is about to bring close to a million square feet online, very little of which is leased. It is one thing to have empty old buildings. Even worse to have empty new buildings. That would really set the progress back. Wow...some of you guys are following your stocks too closely. Even in a down market there are gems to be bought. Downtown Durham is a gem. Like the DDI leader said, it will not be what it was in the past (where everybody shopped downtown) but it will transform into one of the important centers in the city. I would say that Greenfire's development will be a rising tide but a tide recedes. I guess I'll call "Bull City" Warming due to the "Greenfire" Effect...the melting of the ice cold market will cause the water levels to rise. BTW, who was hanging out on Glenwood South 15 years ago??? If it wasn't for Glenwood South, would there be anybody in downtown Raleigh after dark??? The point is...it will take a while for people to consider downtown a destination after 5pm in Raleigh (yes Raleigh still has a way to go...a downtown arena would have helped tremendously) and Durham. It helps by adding residences and shops in order to build somewhat of critical mass. 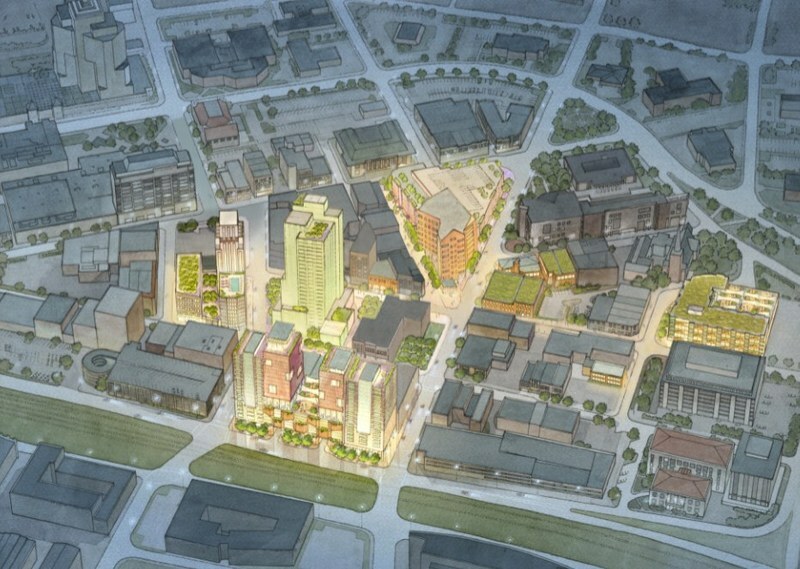 Greenfire's development will be a boost for all of downtown.